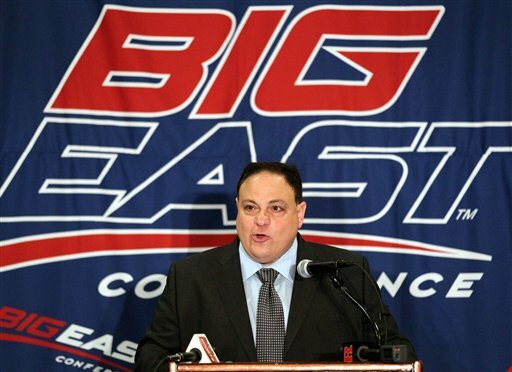 John Marinatto is out as Big East commissioner. His departure was first reported by CBS Sports’ Brett McMurphy, who also reported that Marinatto may have jumped before he was pushed — league presidents asked for his resignation Sunday, according to McMurphy’s sources. Marinatto extolled the virtues of the academy’s football-only move to the Big East alongside Navy officials shortly after the official announcement was named. The commish since 2009, he was behind the conference’s expansion efforts that have ranged from next-door neighbors to Conference USA refugees to schools on the other side of the country. He’s also been on hand for the defection of West Virginia to the Big 12 and the planned defections of Pitt and Syracuse to the Atlantic Coast Conference sometime after this football season. An interim successor has been named, but no timeline has been set for a permanent replacement. Why would Navy fans need to worry about Marinatto’s departure, years before the Mids begin conference play? Click through to find out. 1. Friends in high places. During the Mids-to-Big East news conference, Navy athletic director Chet Gladchuk thanked Marinatto for his “confidence,” “patience,” “composure” and “leadership” — all in less than five sentences. Sure, it might’ve been a traditional case of microphone-induced hyperbole, but it’s clear that a prime contributor to Navy’s move into conference play is gone. And while the new commish will have to be comfortable with (or at least accepting of) the league’s structure before taking the job, there’s no guarantee he or she will advocate as strongly for the Mids’ interests — Saturday afternoon home games and a wide berth to accommodate nonconference games with Army, Air Force and Notre Dame, for instance — as someone who brought the school aboard in the first place. 2. Empty seat at the table. As the initial reports pointed out, Marinatto’s ouster comes as the conferences debate changes to the Bowl Championship Series, which could include a four-team playoff come 2014. Marinatto represented the league at those high-level meetings, according to McMurphy; even if interim commish Joseph A. Bailey III (former CEO of the Miami Dolphins, according to this report) steps in, he’ll be a new face playing an already weak hand. 3. All about the money? Navy’s reasons for leaving independent football behind were many — stability in scheduling, strength in television negotiations, finding the right level of competition, etc. But one that was generally left unsaid was the cash the school would be in line to reap as part of the Big East’s upcoming television deal, which will be negotiated later this year. Marinatto was to be at the forefront of those negotiations. It’ll be up to the new leadership to sort out a multiyear, multiplatform deal, likely with two or more major media players. 4. Exit-fee fiasco. It’s a line near the end of McMurphy’s report, but it could be the most telling: “To help stabilize the league, Marinatto recommended last October to increase the Big East’s exit fee from $5 million to $12 million-$15 million. However, the league’s presidents declined to do so.” In other words, the presidents kept their escape hatch at a reasonable number and have since jettisoned the man who suggested a stricter exit penalty. Time to fire up those Connecticut-to-the-ACC and Louisville-to-the-Big 12 rumors (it’s already starting). 5. Stuck on the sideline. Navy won’t join the league until after every other incoming school. And it will only join in football, whereas other universities will become full members. ESPN has reported that some of the league’s basketball schools were behind Marinatto’s departure, voicing their displeasure in the football-driven nature of league expansion (Anybody looking forward to Rutgers-SMU hoops on ESPN? Didn’t think so). If the hoops squad led the revolt, and the rest of the new teams will be in place well before Navy settles in, where does that leave the Mids when it comes to helping set the conference agenda? Desperate for a silver lining? Click here for a countdown to the football season-opener in Ireland — when the focus shifts away from the business of college sports and back to the field.